Henri Cartier-Bresson’s striking black and white images transform everyday subject matter. An innovator in street photography, Cartier-Bresson’s eye for composition saw the artist capture Paris with an idiosyncratic flash of humour: a man perched on a bicycle reading a newspaper, a father and son stalked by a gigantic man on a billboard. 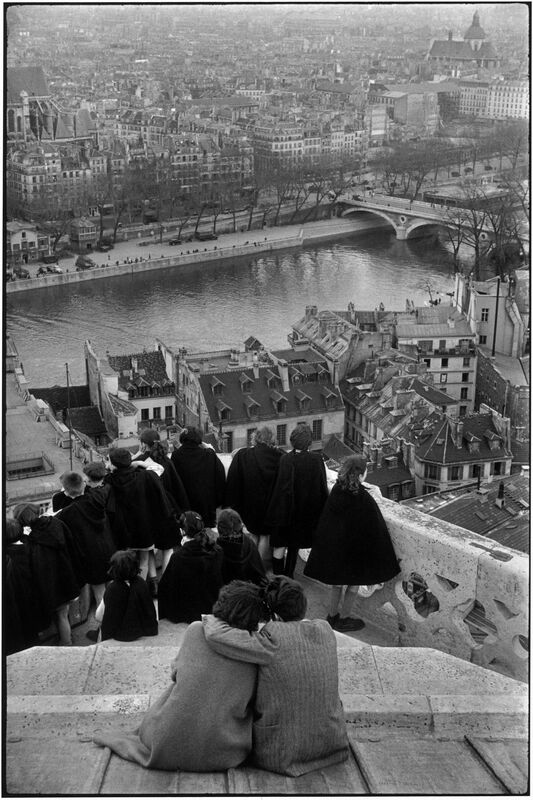 The exhibition Henri Cartier-Bresson: Paris at the Sainsbury Centre for Visual Arts in Norwich will exhibit 83 of Cartier-Bresson's photographs of the French capital, many of which have never previously been shown in the UK. The images captured between 1929 and 1985 demonstrate an array of subject matter taken from all sections of society. From haute couture at the 1957 Christian Dior fashion show, with rows of mature, dark-clad admirers gazing up at a youthful blonde model, to the flooded Gare Saint-Lazare, place de l’Europe, 1932, in which the viewer experiences the binary of real-life Paris, juxtaposed by a reflection of the city that appears almost as substantial as the buildings themselves. Cartier-Bresson broke with convention in his rejection of flash photography and his opposition to any form of post-production cropping. Instead, he abandoned any photographs that had not been framed or composed correctly. He described his craft in his 1952 book, The Decisive Moment. “Photographing, for me, is instant drawing, and the secret is to forget you are carrying a camera... ”. He defined his technique as “sketching” because of its spontaneity and he photographed his subjects covertly using a compact 35mm Leica camera. Born in 1908, Cartier-Bresson exhibited his first photography collection at the Julien Levy Gallery in New York, 1933, and in 1937 he took a job in Paris as a press photographer, earning him his reputation as the founder of photojournalism. 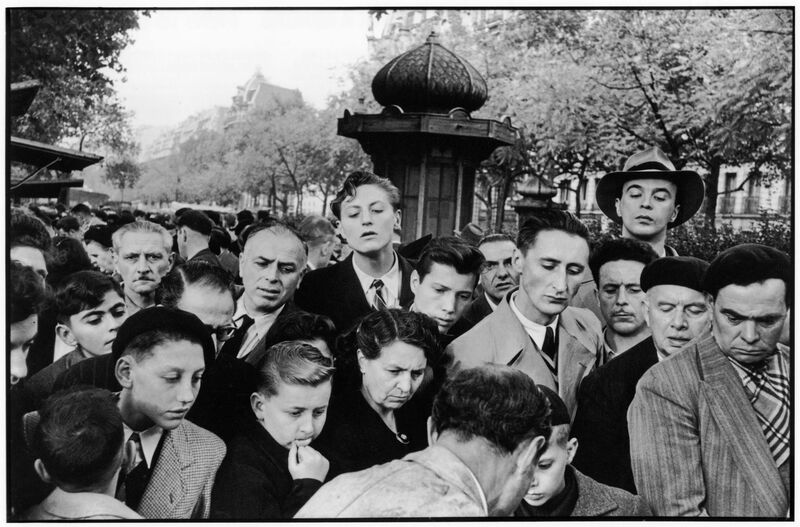 Henri Cartier-Bresson: Paris has been organised in conjunction with the photography agency Magnum Photos, which Cartier-Bresson co-founded in 1947, and the Fondation Henri Cartier-Bresson, which he established in 2003 to ensure his legacy. Henri Cartier-Bresson: Paris will open in conjunction with Alberto Giacometti: A Line through Time. The Giacometti show commemorates the 50th anniversary of the Swiss artist’s death as well as examining Giacometti’s influence on his contemporaries in Paris, Cartier-Bresson among them. Giacometti was a painter, sculptor, draftsman and print-maker but it was his sculptures in particular, with their elongated human forms, which earned him international recognition. Cartier-Bresson endorsed Giacometti as his favourite artist and although their media differed, the two artists shared a common fascination with humanity and the surrealist movement. Cartier-Bresson photographed Giacometti several times during his lifetime. Henri Cartier-Bresson: Paris depicts this relationship with an image taken by Cartier-Bresson in 1961 showing the solitary figure of Alberto Giacometti battling against the rain on rue d’Alésia.